When you run IMSeoArchive Indexer for the first time a modal window will appear. 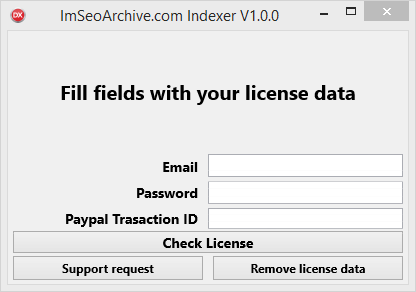 •activate IMSeoArchive Indexer: remember that license is linked to your PC/Mac and you can activate only one copy of my software per PC/Mac. You can migrate license to another PC/Mac after one month since first activation on that system. To activate my software are necessary three infos: email, password and Paypal transaction ID that you have received after your purchase. After you can click on “Check license” button and the software will be activated. •Send a support request: clicking on “Support request” button a new mail will be ready to contact me for support requests. •Remove license data: you can delete license data. A restart is required.